Prior to issuing a payment to any vendor, you should first request they complete and return to you a Form W9. You'll want to save this form in your files. Next, set up the vendor in QuickBooks ("Vendors" > "Vendor Center"). Click the button for "New Vendor" or locate a prior vendor to edit. Input a vendor name and complete the address info fields. 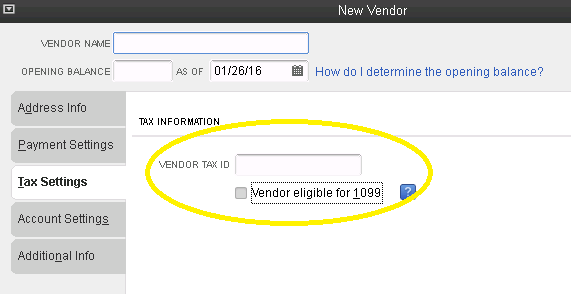 Under "Tax Settings," input the vendor tax ID and check the box to indicate "1099 Eligible." By having your vendors flagged as 1099 eligible prior to paying them, it will make year-end 1099 reporting much easier.